Libya's rebels said they suffered "many casualties" Sunday as they advanced on Mouammer Gaddafi’s forces in the western port town of Zawiyah, after losing a captured tank and four fighters in a mistaken NATO air raid. "Our forces are in control of the western and southern gates of Zawiyah, and have pushed three kilometres (1.8 miles) into the city," Bashir Ahmed Ali, commander of the battalion fighting to wrest the town from Gaddafi’s forces, told AFP. "Regime forces are in control of the east and main centre of the town, where snipers are stationed on top of many buildings. We have suffered many casualties from the snipers," he said without giving a precise number. "There are also snipers in the residential areas, where some families are virtual hostages in their own homes," he said. Government spokesman Mussa Ibrahim told reporters late Saturday that Zawiyah, a strategic town some 50 kilometres (32 miles) west of Tripoli and the last barrier before the rebels close in on the capital itself, was completely under government control. In the south end of Zawiyah's Surnam region, an AFP reporter witnessed heavy fighting between rebel and regime forces on Sunday. Gaddafi’s forces were shelling rebels from inside the town, he said. There was an increasing exodus of families fleeing from Tripoli and Zawiyah toward the town of Zintan, southeast of the Libyan capital, he reported. NATO warplanes on Saturday mistakenly destroyed a tank captured from Gaddafi’s forces in Zawiyah, killing four rebels, an AFP photographer said. The tank was captured when the rebels on Saturday launched an assault on Zawiyah, overrunning the western sector but encountering fierce resistance from Gaddafi’s troops who took up positions in the east. Rebels on the ground said they were driving the tank out of Zawiyah when the NATO warplanes struck, destroying the vehicle. The photographer saw pools of blood in front of the tank and was told four insurgents had been killed in the air strike. NATO said in its daily update that its warplanes struck two tanks in Zawiyah on Saturday, out of 13 hits around the country. UN Security Council Resolution 1973 authorised NATO in March to defend Libya's civilian population from attacks by Gaddafi’s regime, which faces a popular revolt after 42 years in power. Under the mandate, NATO planes regularly attack Gaddafi’s military assets, including tanks, armoured vehicles, rocket launchers, army bases and munitions dumps. Ibrahim told reporters in Tripoli on Saturday that less than 100 fighters tried to enter the town to join up with about 50 rebels inside Zawiyah. "This is not an advance. This is what you call a skirmish, what you call a suicide mission," he said. "You have to remember we are very powerful. Tens of thousands of volunteers are armed right now." The rebels have launched numerous unsuccessful assaults on Zawiyah after losing it to Gaddafi’s forces in March. In a spurt of military activity, rebels fighting east of Tripoli said they strengthened their grip on the town of Tuarga in a bid to create a buffer zone between Gaddafi’s forces and the city of Misrata. The insurgents said that two rebels were killed and 15 wounded Saturday in the third day of fighting in Tuarga. 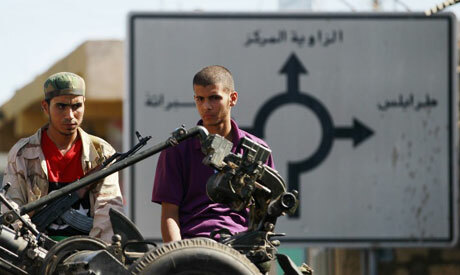 Rebels also said they gained ground on Saturday in the government-held oil town of Brega. "We have taken control of residential area number 2, after number 3 yesterday," out of four zones, a military spokesman, Mohammed Zawiwa, told AFP. "The pipe factory has fallen into our hands today." Libya's Deputy Foreign Minister Khaled Kaaim on Saturday denied the rebels had entered Brega almost six months after rising up against Gaddafi’s forces, inspired by revolts in Egypt and Tunisia. They vowed on Friday that in "a few days" they plan to retake Brega on the Gulf of Sirte. Rebels, backed by NATO helicopters, have tried for the past three weeks to seize the vital port 240 kilometres (140 miles) southwest of their eastern stronghold of Benghazi.